Be the first to share your favorite memory, photo or story of Damon . This memorial page is dedicated for family, friends and future generations to celebrate the life of their loved one. 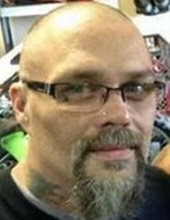 Damon Cory King, 42, of Davenport passed away February 7, 2019 at Clarissa C. Cook Hospice House, Bettendorf. Cremation rites will be accorded by Quad Cities Cremation Center and services will be private. Damon was born May 22, 1976 in Davenport, IA the son of Gary Bailey and Jodi King. He enjoyed art and tattooing. Survivors include his mother Jodi (Randy Bugh) King; daughters Paige Segura and Isabelle King; grandmother Beverly Brandon and close friends Rob Lowder III, Mike Jackson, and Scotty Werts. Damon was preceded in death by his father and brother Brandon Andresen. To plant a tree in memory of Damon King, please visit our Tribute Store. "Email Address" would like to share the life celebration of Damon King. Click on the "link" to go to share a favorite memory or leave a condolence message for the family.